A sprayed on polyurethane foam roof provides the highest R-factor of any roofing material now in existence... resulting in 25-30% cost savings, and less wear and tear on your heating and cooling systems. Polyurethane foam can be applied to surfaces with irregular shapes and penetrations. Applications include tanks, pipes, cold storage rooms and flotation devices. It's especially suited for roofing, as many applications can be made over the existing roof. This can eliminate the need for costly tear-off of the old roof. Polyurethane foams form monolithic, self-flashing surfaces which effectively seal against leaks. Further protection comes from the weather resistant, elastomeric coating applied over the foam. The foam can be sprayed with slope to drains, facilitating water removal. A seamless layer of foam is fully adhered to the substrate (vertical or horizontal) and withstands high wind stresses. The applied polyurethane foam system usually requires no maintenance. If damaged, caulking is sufficient for repair in most cases. 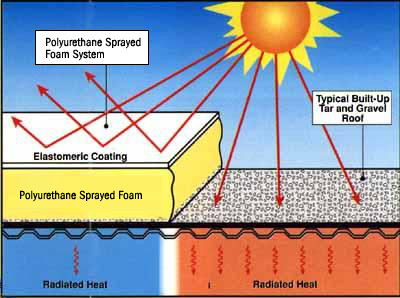 Polyurethane foam is the most efficient form of insulation currently available. Our systems usually pay for themselves in about 7 years with energy savings. By placing the insulation on the outside, the foam system reduces building movement and thermal shock. Complete polyurethane foam systems are typically many times lighter than tar and gravel roof systems. When applied to an existing roof, the loose ballast removed usually weighs more than the replacement foam system. This results in the new roof being lighter than the original. Our Polyurethane sprayed foams are Fire Retardant and listed under UL 790* and UL 723*. UL 790 roofing systems are listed Class A over non-combustible decks and Class B over combustible decks. Polyurethane foams contain no asbestos or formaldehyde. Polyurethane sprayed foam systems have been applied successfully for over 50 years! Our first month's PG&E bill was 20% lower than the previous year... and last year was mild compared to this year's 100+ degree temperatures. Call us at (510) 581-7747 to discuss your roofing needs! © 2019 Custom Craft Urethane. All content and images on this site are copyright protected. Any unauthorized use or plagiarism of any content or images will be prosecuted to the fullest extent of the law.